It worked out all right in the end for Grenada's cricket faithful, as their first taste of international action for four years was reduced from a two-match festival of cricket to one single afternoon of six-smoking carnage. After Monday's rain had given way to Wednesday's clear skies, it was as though the England and West Indies batsmen had been unleashed from the dressing room via slingshots. Both teams tore into the bowling with a world-record 46 sixes in 98 overs of action - 24 for England, 22 for West Indies; 14 for Chris Gayle, 12 for Jos Buttler, whose innings of 150 from 77 balls was one of the most staggering onslaughts ever witnessed on the world stage. And the upshot is a series which England now have within their grasp. They lead 2-1 with just the decider in St Lucia to come, and while everything between now and the end of May pales compared to the challenge that awaits at this summer's World Cup, there are bragging rights aplenty available in this final contest. England, for starters, would really rather like a piece of silverware to take home from the Caribbean, given how quickly their hopes in the Test series were detonated by Jason Holder and his cohorts. But there's also that thorny question of "momentum" - a nebulous concept at the best of times, and one that most teams are happy to play up or down, as it suits them. But nevertheless, with India breathing down England's necks ahead of their own ODI series against Australia, a West Indies win could open the door for a new No.1 team to be anointed going into the World Cup. Perhaps that might reduce some of the home-team pressure on Eoin Morgan's men, but to judge by their approach throughout their renaissance run of form since 2015, they are dead-set on hitting the front and staying there in every contest they play. All things being equal, England start as favourites - as well they might, given the run of form they've been on in the 50-over format in recent years - but this contest will surely be decided, as with each of the other three so far, by the team that holds its nerve for longest in what looks likely to be another daunting run-chase. England did remarkably well to chase 361 in the opening match in Barbados, eventually easing to their target with eight balls and five wickets to spare. But two days later, they tumbled off the tightrope in dramatic fashion, losing their last six wickets for 35 runs in pursuit of 290. West Indies fell away even more quickly in Grenada, losing their last four wickets in five deliveries from Adil Rashid, but by that stage they had 389 on the board, more than any team in history to have been bowled out inside their 50 overs. Which just goes to show, none of these games is over until it is over. And even the beleaguered bowlers on both teams can produce match-turning moments in the blink of an eye. But don't blink too often … when 46 sixes are raining into the stands, it's not wise to take your eyes off the action for a second. He's been a revelation in England's one-day side for the past couple of seasons, and - assuming his dodgy knees don't creak unnecessarily between now and May - he'll be one of the first names on the team-sheet for England's World Cup opener at The Oval against South Africa. But Chris Woakes found little respite in Wednesday's brutal engagement. His ten overs were dispatched for 91, the joint fourth-most expensive in England's ODI history, and though a swingless venue with short boundaries was never likely to be his favourite hunting ground, his inability to find a go-to line and length as the big hits continued to rain down was a concern. He'll be looking for a big response in St Lucia, for his own peace of mind, if nothing else. It takes a special type of player to be caught second-ball for six - and that is exactly what Shimron Hetmyer remains, despite his hot-headed cameo in Grenada that some observers believe was the turning point of West Indies' spirited pursuit of England's 418 for 6. Who knows what might have happened with a modicum of discretion against the extra pace of Mark Wood - the only bowler who was truly able to transcend the conditions in the 4th ODI. But then again, Hetmyer has done just fine in his young and explosive career by trusting his instincts, his technique and his immense power. His century in the second match in Barbados has kept his team in the hunt in this series, and while he may have been momentarily chastened in his latest outing, don't expect him to change his ways too drastically. Will Andre Russell play, or won't he? There was some surprise at the toss in Grenada when Jason Holder announced he would be missing out - ostensibly to give him more time to recover from his long flight from the UAE, where he had been playing for Multan Sultans in the PSL. There was an apparent indication that his long-anticipated return would come in this final game. But, just to complicate matters further, the man whom he is mostly likely to replace - Carlos Brathwaite - stepped up in his team's hour of need with his maiden ODI fifty, a key contribution to a seventh-wicket stand of 88 with Ashley Nurse that took the chase into the final three overs. It's still hard to see who else could make way, however, assuming that testing Russell's fitness over 50 overs is a priority before the World Cup squads are finalised next month. Woe betide the batsman who gives his rival a sniff of an opportunity in England's power-packed line-up. 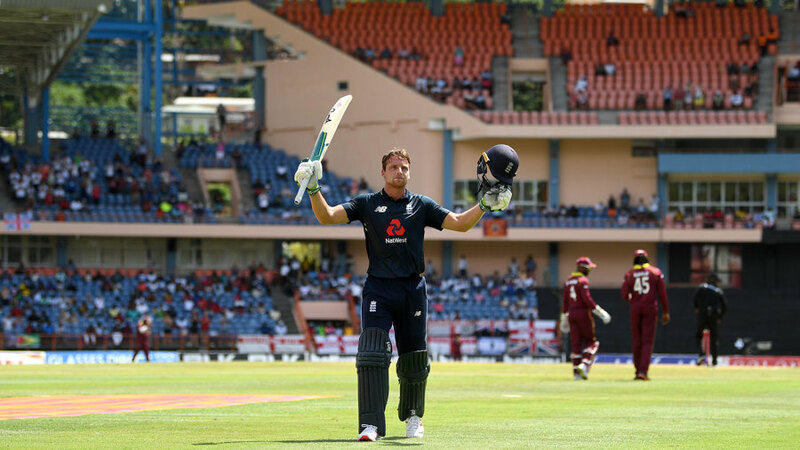 Jason Roy's hamstring strain allowed Alex Hales to come romping off the bench in Grenada with an agenda-setting 82 from 73 balls - and with Jonny Bairstow also chipping in with a brisk half-century, the pair did a pretty seamless job in closing ranks for their side at the top of the order. Roy, to be fair, does have a 65-ball hundred to his credit in this series already, but he's unlikely to be risked so soon after his niggle. The only other issue to ponder is a rejig in England's bowling ranks to reflect the ease of West Indies' run-making in the series so far. Tom Curran's cunning is the obvious addition, but Woakes is likely to be trusted to recover from Wednesday's thumping. Some scattered showers are expected on Friday, but the weather for the match itself is set fair. The pitch has a reputation as the best in the Caribbean, so batten down the hatches. Funnily enough, there have been just three scores in excess of 300 in the ground's ODI history - and the two highest, 363 for 5 and 331 for 7 were both scored by New Zealand, in the space of three days, against Canada and Kenya in the 2007 World Cup. The highest total involving full-member nations is Pakistan's 303 for 6 way back in 2005. Expect that to change, given the free-scoring carnage we've seen so far in this series. Victory in St Lucia would seal England's tenth consecutive victory in an ODI series of two or more matches, dating back to their 2-1 defeat in India in January 2017. It's not a complete record, however, as the above list omits two rather notable setbacks along the way - England's one-off defeat by Scotland in Edinburgh last summer, and their failure to win the Champions Trophy on home soil in June 2017. Pakistan sealed the spoils after knocking them out in the semi-final in Cardiff. West Indies have had a sketchy recent record at the Darren Sammy Ground in St Lucia. After winning four of their first five ODIs at the venue from 2002 to 2004, they've won just three of their last 20 completed fixtures. They did, however, emerge triumphant from their most recent visit, beating Afghanistan by four wickets in June 2017. Having gone past 5000 runs earlier in the series, Joe Root needs just four more to overtake Paul Collingwood's tally of 5092, and move into third place on England's all-time ODI runs list, behind Ian Bell (5416), and Eoin Morgan (6051). Morgan, in fact, went past 6000 runs for England during his century in Grenada, but has a further 744 runs to his name from his Ireland days. "I've probably never seen anyone hit sixes as easy as he can. He's a legend of the game." Jos Buttler pays tribute to Chris Gayle after his incredible innings of 162 in Grenada. "Buttler is superb. You can't take away the fact that he's one of the best strikers in the world today … but he's not close to the Universe Boss though!" Gayle returns the compliment … sort of … after Buttler's own innings of 150 from 77 balls.